The MapleCloud makes it easy to share your Maple documents and applications with others, even if they don’t have Maple! Interactive: While all documents in the MapleCloud can be viewed, Maple documents that makes use of interactive components such as sliders, dials, and math entry boxes are live applications that can be used by anyone, including people who do not have Maple. Your Math Apps and Maple applications can be used by anyone you choose to share them with, to explore concepts, perform computations, and visualize results. Easy Access: There are many ways to access the content in the MapleCloud. Web Browser: The MapleCloud is accessible from a web browser, from both computers and tablets. You can browse and search collections of Maple content, read documents, and even interact with Maple applications, all without Maple. 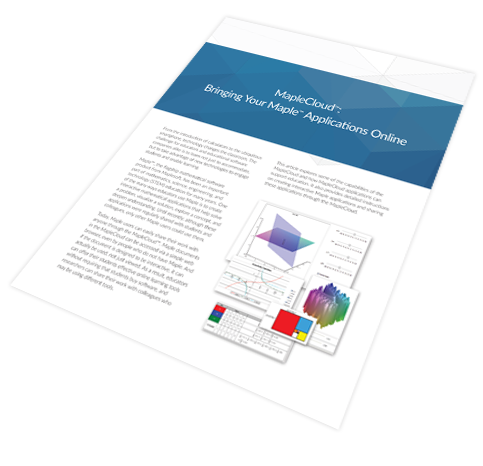 MapleNet provides the mathematical power behind the applications, so all you need is a standard web browser. Free Maple Player: Anyone can access the full MapleCloud from the free Maple Player and interact with the applications there. After downloading the Maple document, the Maple Player can also be used to work offline. Maple: Those who have Maple can access MapleCloud content from within Maple, instantly downloading documents from the MapleCloud into their Maple session. Private and Public Sharing: From inside Maple, you can share your Maple documents in the MapleCloud at a click of a button. You can choose to share your work with members of a private group, such as the students in your class or colleagues on a research project, post them for your own personal use, or make your documents freely accessible by everyone. Ready to Use: There are hundreds of interactive Math Apps available in the MapleCloud that explore concepts from calculus, statistics, graphing, physics, engineering, and more. You can use these Math Apps in your classes and direct your students to them for additional learning. Extended Functionality: For those who have Maple, the MapleCloud gives instant, seamless access to a rich collection of user packages that extends Maple’s abilities, and makes it easier for you to share your own work with others.